I’ve been struggling a bit to get into the Holiday mood this year. Our core group isn’t together, and I think that might be what is weighing on my mind. Dirk, Cheyenne and myself are here in Germany, and Sierra is back in the States. Or, it’s all this damn rain. Don’t get me wrong, we really , really need this rain. We had a very hot and super dry summer here in Germany, and the lakes/rivers are very low for this time of year. But, I come from the Great Lakes area, and when it is this damn cold, there needs to be some snow. Preferably, a lot of snow. No such luck, just damn cold, grey, windy with rain, every single damn day here in Western Germany. We did get the Christmas tree put up the first of December. It lasted nicely for a few weeks before Jack and Newt added their finishing touches to it. This lovely shot was taken after Jack chased Newt, who then hid behind the tree. Jack, unable to stop himself, raced behind the tree to get the cat. Newt escaped unharmed, as always. Jack managed to wrap himself in the Christmas lights and drag the whole damn tree across the floor before it came crashing to the ground. It was over in less than a minute, but it seemed like I was watching the whole event take place in slow motion. It was painful. Most of the ornaments that shattered we not of sentimental value, thankfully. I am still finding pieces of glass with my bare feet, good times. The tree is able to stand back upright, it’s just a bit wonky at the top. Jack has been trying to help everyone get into the Christmas spirit. He even found a sparkly star, and manged to get it stuck on the end of his snout. Hard not to feel a little warm and fuzzy with this guy looking at you intently with a star on his schnoz. Dirk and I have been to one Christmas market so far, we went to the one in Brühl. Neither of us was really “feeling it”, so we stopped at the local Italian restaurant and had a wonderful dinner. So, that was a win. I truly believe that they have the best pizza that I have ever had, anywhere. Cheyenne and I made our yearly attempt to make fudge for Christmas. We had high hopes of being able to gift the fudge to our downstairs neighbors. They are always giving Jack dog treats, and pigs ears. They even give Cheyenne shoes when she is clearing out her shoe hoard. Just really nice people, and we wanted to give them a gift. Well, as usual, Cheyenne and I failed at the fudge making. I currently have a large dish full of a chocolate substance sitting in my kitchen, it is rather gooey, and it has in no way set up like a good fudge. This is a change from our usual, gritty, dry as dust fudge. (We may be able to use it as a frosting of some sort, I haven’t figured this out yet). This failure is actually a yearly event for us, so really not a big surprise. Yet still, somehow a bit disappointing. We are not fudge makers, but we just won’t give up. I have managed to get all of my Holiday cards filled out and they go into the mail tomorrow. This makes me happy. I think I got the obsession for Holiday cards from my Grandma McKay. She would get hundreds of Christmas cards each year, and sent out a ton as well. It was a big deal at their house, she would hang them all over the office, and then they would spread out, down the hall in to the living room. Hundreds of them! I do not send out hundreds of cards, just a few. But, I do hang the cards that I receive up on the wall, just like she did. Today was an exciting day. We got our first Holiday card in the mail! (we don’t get many anymore now that we live in Germany. We do have mail service here in Deutschland, so come on people!). So here it is. The first card comes from my friend, Adrienne. It’s seems that perhaps, I am not the only one struggling to get into the Holiday Mood this year. How about you? Are you feeling festive this year? What are your Holiday wins? I hate the way that Christmas can sometimes feel like forced fun. Just do what ever makes you happy. And oh my god this miserable rain. That’s all we’re getting here too and it’s really getting me down. It’s not usually this wet, this time of year, but like you say- we do need it. Oh and bless Jack & Newt!!! I bet that’s not what you said when you saw the tree though! Yep, and I didn’t say FUDGE either. We are going to try and get to the Koln Christmas markets this weekend, hopefully the rain will slow just a bit. It’s so hard to stand in the rain and drink Gluwein, freezing to damn death. I am sorry about your spirit. I wish you had the Hallmark Channel those movies do really put you in the mood. I have seen a few on Netflicks. Maybe a hot bath followed by Hallmark Christmas movie some choclates and a drink will lift your spirits. I hear ya, Cherie! 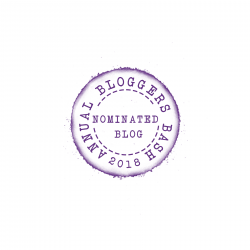 I’m not in the mood yet–might be because I have a ton of work to do this week (so I spent the morning on a blog post and nominated you for the Sunshine Blogger Award–I know, I know, it take a while to complete, but it can be fun! Ignore if you don’t feel like it, or wait ages until you’re uninspired and need a blog post idea, like I did). Your doggie is the cutest and reminds me of the time when my mom’s cat that she adored knocked over and broke most of her special Easter eggs. That was a sad holiday. So, I hope you get more cards and am impressed you’ve already done yours–that’s next weekend for me! Happy Christmas, Happy Pizza! I hope you get more holiday cards and letters soon! Canada’s postal workers recently came off strike, so there’s a huge backlog of mail now and a lot of Canadians waiting for packages and letters. My fingers are crossed that you’re not experiencing any similar issues in Germany. Oh No! Dreadful timing for the holiday packages. So far no issues here. Brilliant card and beautiful dog! Trying to put up the Christmas tree with a cat in the house will take the wind out of anyone’s Christmas sails! Hope your holiday spirits get a lift! Last year, Newt really didn’t bother the tree at all. This year he uses it to hide(and tease) the dog. Usually I live the antics if Jack and Newt but that one wasn’t good. Although, jack looks so cute with a star nose. I’m feeling blah about this holiday as well. We’re in temporary digs partially unpacked getting ready for a bigger move in January. My famous pink tree is up and lit but no ornaments are on it. I was supposed to decorate this past weekend but came down with a horrible stomach bug that laid me low for a few days. Happy Christmas. Oh no. You have so much going on this year. I hope you are feeling better soon. I want to see a picture of this famous pink tree! I still have hope. We will visit the markets in Köln this weekend. Hopefully that will make things feel more like the holidays. Hi Cherie, this year I used an Advent Calendar for the first time but put a prompt in each day that would bring happiness and reduce stress. I call it #my25daycountdowntoahappychristmas. It has helped me so far get into the festive mood and bring some joy to each day. I think I’m at the point where I’m just accepting that I’m not feeling the mood this year. It just isn’t happening and I don’t know why. No need to force it. It is what it is. Perhaps the mood will hit me a few days before Christmas or maybe afterwards. The one thing I’ve noticed is that I’m not stressed out this year. And that’s a good thing! No stress here either. That is a good feeling! We’re going somewhere tropical for Christmas, so we’re skipping a lot of the stuff. But we put up a 12′ tree along with 4 feather trees. The dogs drink the sweet water out of the tree’s base. My sisters and their kids are coming up this weekend for a celebration – instead of turkey, I’m making waffles. My mom has a recipe for fudge she passed too me and I share it with my friends. It’s called “Fool Proof Fudge” and has only 5 ingredients and takes almost no time to make. I’ll share it with you if you’d like. Personally, I make it all the time for other people but don’t like to eat it myself…too rich. Merry Christmas and Bah Humbug too. Oh yes, I would love the recipe! Prepare 8×8 or 9×9 pan by lining with wax paper. Over low heat melt butter and combined with milk. Add chocolate and stir until completely melted. Remove from heat and add vanilla and salt. Pour into pan. The mixture should be smooth and shiny. Refrigerate until solid. Remove from pan and cut. You can use any flavor chip. You can even do a double batch, one peanut butter and one chocolate and make two pans of layered fudge. Let me know how it works for you. Oh dear – not exactly a bright and shiny start to the Christmas season Cherie! That dog and his shiny nose made me smile but the Christmas tree wreckage made me wince – I’d have probably cried a little if it had been my tree! Have a great lead up to your German Christmas – the rain will eventually stop and there will be joy to your world. Jack is always a bright spot in my day, even when he mangled the tree. I love the tree. And the sparkly nose. That’s the true spirit of Christmas. Thanks Ellen, I think so too. The Holidays just few by! Yes, Jack has a way with looking good all the time, can even decorate himself to look good. Silly dog, I love him.